After a rather satisfying test bore into a sandstone slab at “Kimberley” just last week, NASA’s rover Curiosity decided to go all the way for a deep drill excursion into the Red Planet rock target called “Windjana” and successfully collected powdery samples from the interior on Monday evening, May 5, Sol 621, that the rover will soon consume inside her belly for high tech compositional analysis with her state-of-the-art science instruments. NASA reported the great news today, Tuesday, May 6, soon after receiving confirmation of the successful acquisition effort by the hammering drill, located at the terminus of the 1 ton robots 7-foot-long (2 meter) arm. At long last its “Drill, Baby, Drill” time on Mars. The “Kimberley Waypoint” drill campaign into “Windjana” at the Mount Remarkable butte thus marks only the third Martian rock bored for sampling analysis by the SUV sized rover. This also counts as a new type of Mars rock – identified as sandstone, compared to the pair of mudstone rocks bored into last year. The fresh hole in “Windjana” created on Monday night was clearly visible in images received this afternoon and showed it was 0.63 inch (1.6 centimeters) in diameter and about 2.6 inches (6.5 centimeters) deep. The operation went exactly as planned and left behind a residual pile of drill tailings much darker in color compared to the ubiquitous red color seen covering most of Mars surface. The new full-depth hole is very close in proximity to the shallower “Mini-drill” test hole operation carried out on April 29 at Windjama to determine if this site met the science requirements for sampling analysis and delivery to the two onboard, miniaturized chemistry labs – SAM and CheMin. In coming days, the sample will be pulverized and sieved prior to delivery to the Chemistry and Mineralogy instrument (CheMin) and the Sample Analysis at Mars instrument (SAM) for chemical and compositional analysis. 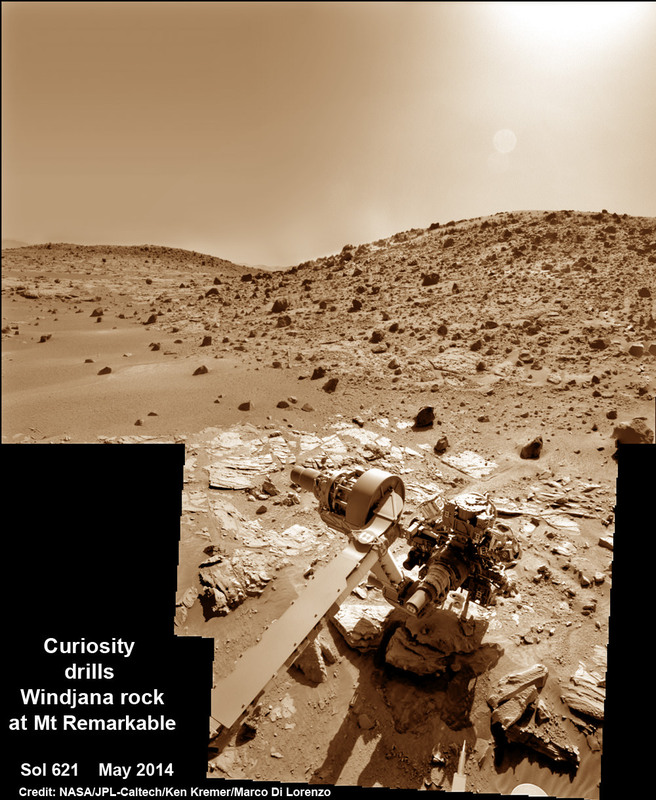 Windjana is an outcrop of sandstone located at the base of a Martian butte named Mount Remarkable at “The “Kimberley Waypoint” – a science stopping point reached by the rover in early April 2014 halfway along its epic trek to towering Mount Sharp, the primary destination of the mission. See herein our illustrative photo mosaics of the Kimberly Waypoint region assembled by the image processing team of Marco Di Lorenzo and Ken Kremer. The first two drill campaigns conducted during 2013 at ‘John Klein’ and ‘Cumberland’ inside Yellowknife Bay were on mudstone rock outcrops. Windjama is about 2.5 miles (4 kilometers) southwest of Yellowknife Bay. Curiosity still has about another 4 kilometers to go to reach the base of Mount Sharp sometime later this year. Is it just me, or has Curiosity been the least interesting rover we’ve put on Mars to date? 20 months, 3 holes and what? Either NASA picked a bad spot or a far more capable science package needs to be sent. It’s not just you, the sentiment appears well spread. It is quite erroneous IMO, ill informed and made from previously unstated desires and wants. (Which, I’ll add, is a good festering ground for restlessness.) Curiosity beat Opportunity to a habitable environment despite the latter being on the road 20 times longer, it found conclusive and close up flowing water remnants and characterized the flows, it found mudstones, and while it is not conclusive the organic residues reported lately are hard to predict from either terrestrial contaminants or impact generation. Do we wish science could proceed faster? Always. But aside from perhaps unrealistic expectations, so far Curiosity has been successful beyond anybody’s dreams (except the predictable naysayers), wrapping up its main science targets in a record speed of 1/2 year vs the minimum 2 year mission target, and has found more surprises than earlier rovers. They have already achieved the mission’s main science goal at the 1st drill… They’re main objective is the mountain still at a good distance at which they HAD thought they’d need to get to before they found their objective past neutral Ph water for a time habitat data. All this current time WAS originally planned just to slowly move it there (to the mountain) as speed is not an option millions of miles of remote control distance away, drilling at the random interesting looking spots as they approached and THEN once at the mountain (still in the distance) they planned to try and get the data THEY ALREADY DID. This mission is already a smashing success and the rest of the next decade or more of it’s roving will be all gravy. I suggest in future paying attention to the entire story before criticizing it…. I’d really like to see them put one of these type rovers on the Moon. It’s kind of stupid to have one on Mars, but not one on the Moon. Don’t come up sandstone only in seas, so more precisely in water’s solution salts calcium? Sad to see the death of Prof. Colin Pillinger today who missed out on a UK Mars lander. Once again, thanks Ken for the great coverage on this fascinating mission! Ahem.. the use of the phrase, “Drill Baby drill!”, although now part of our culture, has become a rather tired euphemism. It brings back memories of Sarah Palan’s approach, i.e. tossing care to the wind and doing whatever it takes to satisfy our country’s energy requirements. She used this phrase as she wanted to despoil ANWR to get at possible oil deposits and thereby potentially ruining one of the last pristine arctic environments. Not unlike ‘fracking’, which has been shown to pollute ground waters and cause irreparable damages to the environment, drilling for oil in the arctic is beyond stupidity… there’s NO WAY it can be done without degradation to that fragile landscape and fauna. The phrase should be retired and relegated to history. Though Mars looks bare and lifeless, it is a beautiful planet, I would like to know if it rains in Mars? Some time back you wrote that they found water but you never talked about rain.